I am the officially driveway shoveler on snow days for my house. 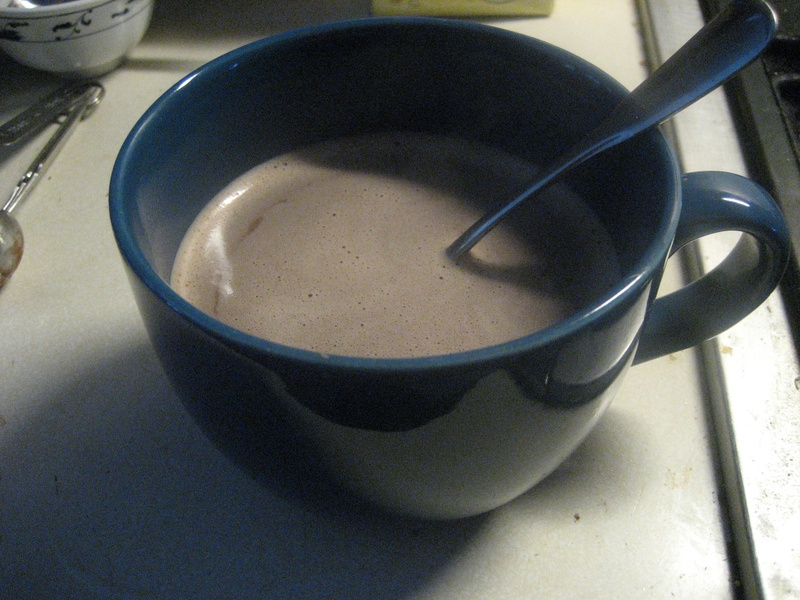 Depending on the amount of snow fall, it can be a lot of work, so to treat myself with a job well done cup of hot cocoa. My recipe is pretty basic. I am not a whip cream on top of hot coco fan. If I have a few mini marshmallows, I would throw a few in. Heat the milk in a small pan. Add the sugar and stir. In a small bowl, mix the coco with a little milk, until is forms a thick paste. Mix in the cocoa into the milk and heat till hot, but not boiling. 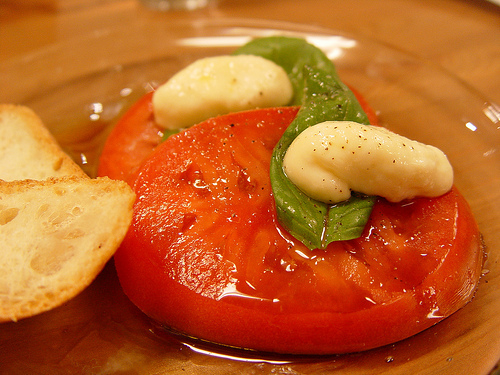 I came across this great post about homemade mozzarella cheese making and want to share it. Check it out. 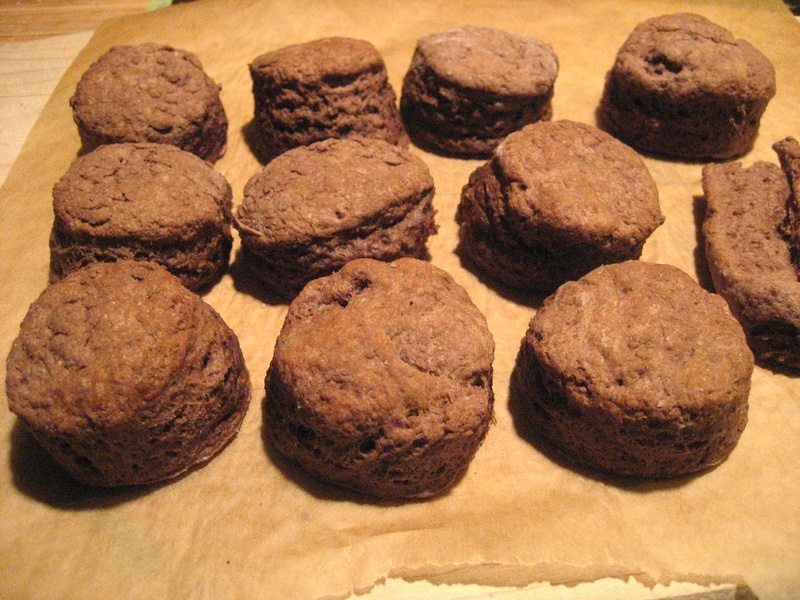 In a food processor, combine the flour, baking powder, baking soda, sugar, coco powder and salt. Pulse to mix. Cube the butter and add to the food processor. Pulse the until the butter is combine to create a sandy mixture. Pour the content from the food processor into a bowl. Make a well in the center and pour in the chilled buttermilk, and the chopped chocolate chips. Mix to form a sticky dough. Dump out the dough on a well floured surface. Fold the dough a few time, but do not over work it. Roll out the dough with a floured rolling pin to a thickness of one inch. Using a biscuit cutter, cut out biscuits in a straight up and down motion. Do not twist when cutting out the biscuits. Twisting will seal the sides of your biscuits preventing your biscuits from rising and making for tough, flat biscuits. It seems natural to want to twist, but don’t do it. 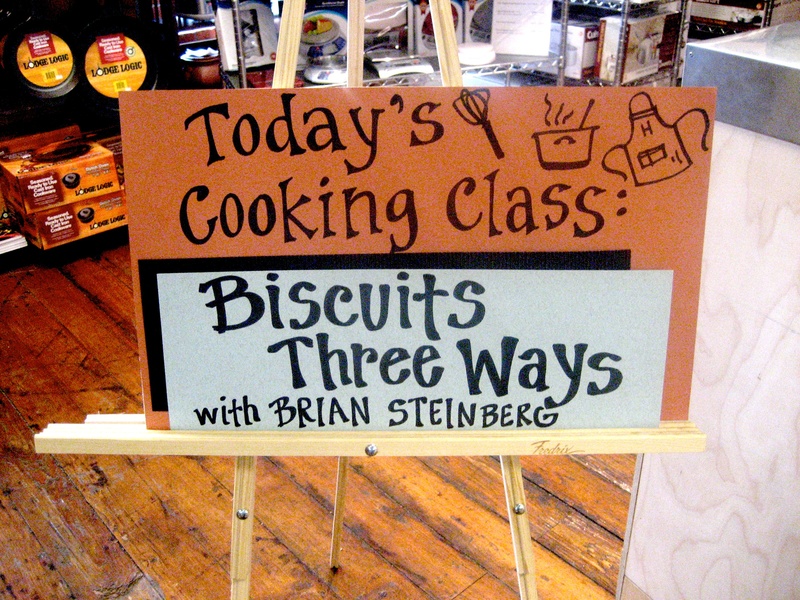 Place the cut out biscuits on a parchment paper lined baking sheet so that they are close but not touching. When you have cut out all of the biscuit you can on the first pass of rolled out dough, reform the scrap pieces and roll out again and cut more biscuits until you use all of the dough. I find that there always a small piece left over that is too small to form a full biscuit. I usually roll that into a tube and cook it along with the rest for a “first taste” biscuit. Once all of the biscuits are on the pan, cook for 10-12 minutes in the center of the oven until golden brown. Brush with melted butter. Serve with vanilla ice cream, strawberries or raspberries and sprinkle with chocolate shavings. Note: Not all sugar is vegan. -Serve with your favorite vegan ice “cream” such as coconut milk, soy, or rice cream varieties. Today is Fat Tuesday or Mardi Gras. In Michigan, it is Paczki Day. The day to celebrate and pig out on huge polish pastries before lent. Now I do not go for the lent thing being jewish, but any holiday that features a king sized doughnut, I am in. That is where Paczki (Poonch-key) day comes in. 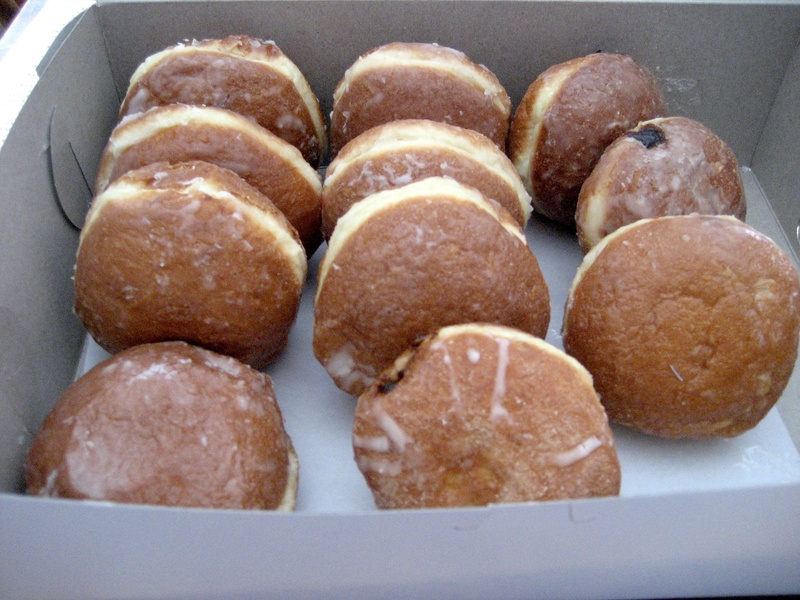 Paczki are polish large fried dough filled with a variety of preserves and fillings. There is lemon, custard, rose hip, plum, strawberry, raspberry and more. I am a traditionalist and go for the raspberry. (That being my tradition). Rose and plum are traditional. There are currently 11 on our house. Emily will not be partaking this year so that means 4 paczkis a piece. Ranging from 400-600 per, we are talking about 2200 calories of yummy fried goodness a piece. No wonder it is called fat tuesday. We got ours at copernicus deli. They sell out every year, and there can be a line, so get there quick. Postscript: I like to heat up mine paczkis in the toaster oven for a few minutes. What happens ever year is that I can never figure out which flavor I am grabbing for. Is the red filling raspberry, strawberry, or rose? This year my raspberry ended up being a rose, which was good. I had one rose and one plum. When I went to my weights class tonight, I wished everyone a happy Paczki Day, but my instructor and a few others dismissed this holiday as an affront to their workout. Tough room I thought until a polish woman on the treadmill next to me whispered that she loves paczki day and had two. Happy Paczki Day to all. It is time again to sign up for a CSA (Community Supported Agriculture). How CSA works is by having people sign up in advance for a share of the harvest from a farm. Members pay up front for their share, and each week during the growing season, they receive a share box of assorted vegetable. Some CSA’s offer full and half shares. Others also include items besides vegetables as part of a share or for an extra price some offer chickens and meat, eggs, honey, baked goods, flowers, diary, vegetable starts etc. The arrangement usually works out well for both the members and the farmer. The farmer gets some of his/her up front cost covered, and has a better idea about how much to grow. The members receive fresh vegetable in season harvested usually the day they receive their share box. Members also may get to visit the farm, attend work parties and social events, and in general have a relationship with their farmer and know where their food is coming from. Members may also have a say in part to what is grown. Fell free to tell your farmer what you like, and he/she might be able to accommodate. The idea behind a CSA is that the members share the bounty and the risk of an unpredictable harvest of a farm. Sharing the risk is key. For example, if your CSA experiences a bout of tomato blight then you will not have tomatoes in your share. While at the same time, they might have a bumper crop of strawberries, so it can all work out. Expereinced CSA farmers will grow a large variety of seasonal vegetables to acount for mishaps. CSA’s vary greatly in what a farm offers, the cost, the amount of vegetables in the share boxes, and the number of weeks/share boxes in a seaon. Some go year round. 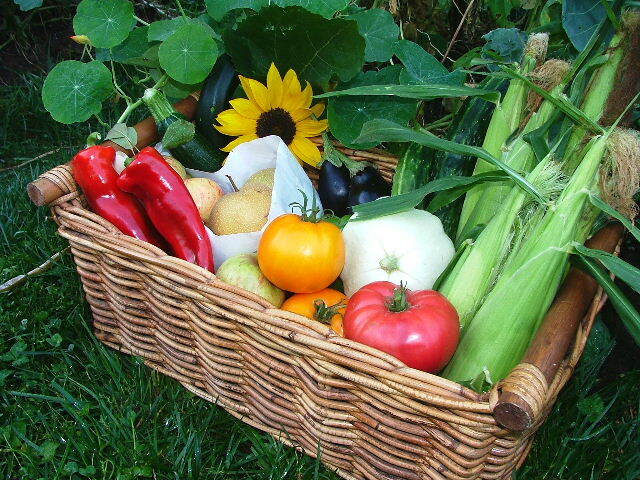 Others offer meat, bread, eggs, dairy, and or prepared or frozen vegetable CSA’s instead of seasonal raw vegetables. Some only offer full shares. Also popular CSA’s can be very hard to get into because of a strong local following. So it is a good idea to sign up early if you can. So how do you choose a CSA that is right for you, and how do you get the most out of your CSA? Most CSA’s that have been going for a few years have a blog or a newsletter. I suggest checking out the the farms blog. Most will have a picture and info about each weeks share from last season. This will give you a great heads up about what the last years shares looked like and what you will/might get in this years. Some of the vegetables in the share may be new to you, which is a good thing. My experience with CSA introduced me to parsley and celery root, garlic whistles, pea tendrils, corn shoots, baby beet greens, and much more. CSA members in my opinion need to be adventurous eaters and cooks with trying new vegetables. Farmer often provide recipes and suggestion for uses of their veggies. If you are too picky, a CSA might not be the best fit. The picky vegetable eater may find themselves frustrated with half their week share consisting of foods they do not eat. The key to a successful CSA experience is to see each new seasonal vegetable as a challenge to find something tasty to make with it. And the more veggies we try, the more we may like, and the healthier we will be from having a variety of nutrients in our food. Likewise, a CSA share may consist with a lot of one item for a few weeks in a row. That is simply how the growing season works. I get excited by when a new veggies appears in my share, and then I’ll see it again and again, until I am tired of it, but just when I am it is gone and a new seasonal veggie appears. So be prepare for new veggies and too much of one veggie. The alternative to a CSA is to go to the farmers market and choice what you want with your $20-30 dollar CSA share budget. Some of the same farmers who offer a CSA also sell at the market. There is snow on the ground, and the weather has been in the 30-20’s all week, so why am I writing about gardening? February is the time when seed catalogs start coming in. In the comforts of my warm winter house, I start planning what I am going to grow next year. This is when I factor how much space I have to grow. 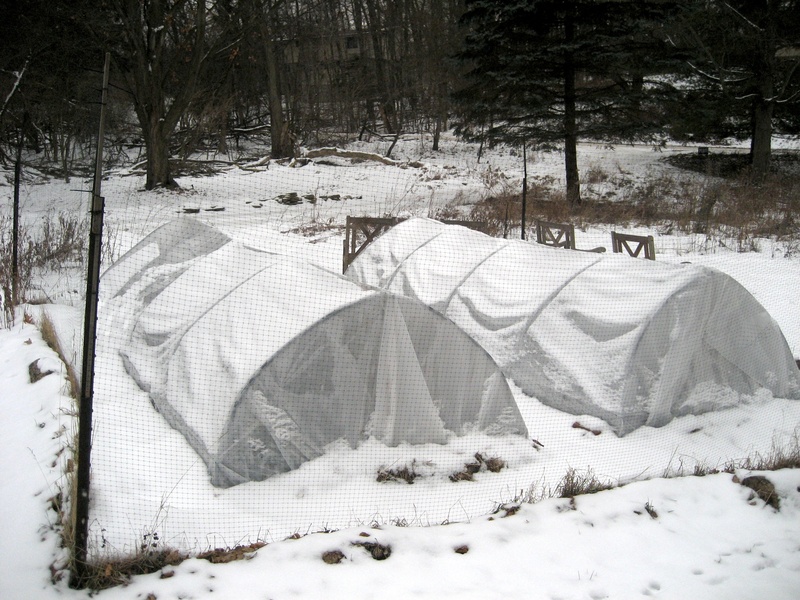 Will I increase the size of my garden, or even rent a community garden plot? Will I try for a early start with row covers, or try starting seeds inside under lights? And will I try to grow some new veggies or play around with european or asian plant varieties to experiment with new cuisines? Such are the questions of the February arm chair gardner. Usually my eyes that are glued to the seed catalogs are bigger than my available garden space. That usually does not stop me from growing way more than my family can eat. But right now is the time to decide what I am going to grow next year. This means that I’m planning what I am going to be eating some 4-6 months in advance. Usually I sit down and make a menu for the week on Sunday. Before then I am not sure what I will being eating. So thinking about food six months in advance is a rather interesting concept. In fact this process started in the fall. This year I have done something different. Based on the Elliot Coleman’s winter gardening books, I decided to plant my garden in the fall to get a jump on early spring. The picture above shows my garden with plastic hoop row covers. The idea is to plant early spring crops like beets, broccoli, carrots, scallions, arugula, and more in the late fall. The row covers provide some extra warmth, and protect from winter wind. When spring comes around, hopefully the plants will take off and start growing earlier. With most of early spring planted, there is late spring and summer seeds to think about. So what seeds are on the list? I am still looking, but I am thinking about growing some southern food varieties like turnip greens. If I rent a garden plot, I might grow some flowers for the honey bees, and I have been looking into growing potatoes in bins (See future garden post). The Obama Administration will be asking Congress to restrict vending machines of sugary, high-fat snacks, and high-calorie drinks in our children’s schools. I say it is about time. But it will not be that easy, even with childhood obesity on the rise, which leads to the increase of childhood-onset Type II Diabetes. Why the big fight to get vending machines out of our kids schools, or at least taking the unhealthy stuff out? The answer is the money. 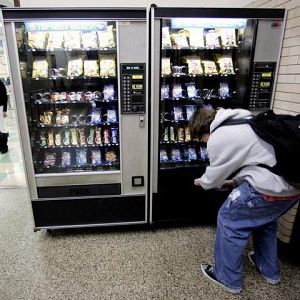 Schools rely on vending machine profits to use in after-school programs. So does that mean that we need to sell our kids’ health down the river so the track team has sports jerseys? That seems to be the case. It was not long ago when no schools had vending machines. There were none in my schools growing up in the 80’s. Looking back on it now, I am certain that I would have been an obese kid if there were. I was a snack junkie as a kid. A few times a week, I would venture out for a snack run for candy, pop, or maybe a slice of pizza. My pocket money was shared between my two kid vices of video games and snack foods. The thing about my snack run was that I had to either walk or ride my bike to the store to get them. I grew up in the edge of the New Jersey suburbs, so the closest store was 2-3 miles from my house. That meant that my snack runs required at least a 4-6 mile bike ride. And if I wanted a slice of pizza and a visit to the video arcade, it was a ten mile round-trip by bike. Nowadays kids camp out in front of their computer, but we had the arcade. I figure all of my bike riding to get snacks helped keep me fit. My snacking had put an extra 10-15 pounds on me as a kid, but I was never obese. But what would have happened if I had a ready supply of pop, candy, and snacks right out my classroom door? It is hard to say for sure, but I figure I would have had a bottle of soda and an ongoing bag of chips, or candy bar in my book-bag at all times. My every couple of days snack runs would have been replaced with several vending machine trips daily. Even though I was a snack and candy junkie, I never ate them during school time. Sure, I ate tater tots, and pizza in the cafeteria, but there was no soda, pastry, cookies, chips, candy or desserts offered. Those 20-ounce sodas in the vending machine can be 250 calories and they can add up. If the average kid had just one of those a day five days a week thats 1250 calories a week, 5000 a month, 60,000 a year. A pound of fat in excess calories is 3500. So that one soda a day of extra calories could create a 17 pounds weight gain in a year. The lack of vending machines in my school most likely saved me from an unhealthy childhood. Today children have no such protection. Schools have entered into an unhealthy bargain with snack, and beverage companies for money, that in my opinion, should come from the public. I remember kids would come around to my house and ask for a booster donation for their teams. Now soda and snack companies are our sports team boosters, but at a price. Hopefully there is the political will to reverse the vending machine trend. Kids deserve better.